Trish and Mike love their new home! Who is the best builder for you? Are you dreaming about building a new home and getting just what you want, on the lot of your choice? It takes some time and work but new construction can be worth it, especially if you know what you want and are flexible. Your best building opportunities are in the far North of the Triangle near Wake Forest, Apex, Holly Springs,West Cary and in Chatham County just south of Chapel Hill. 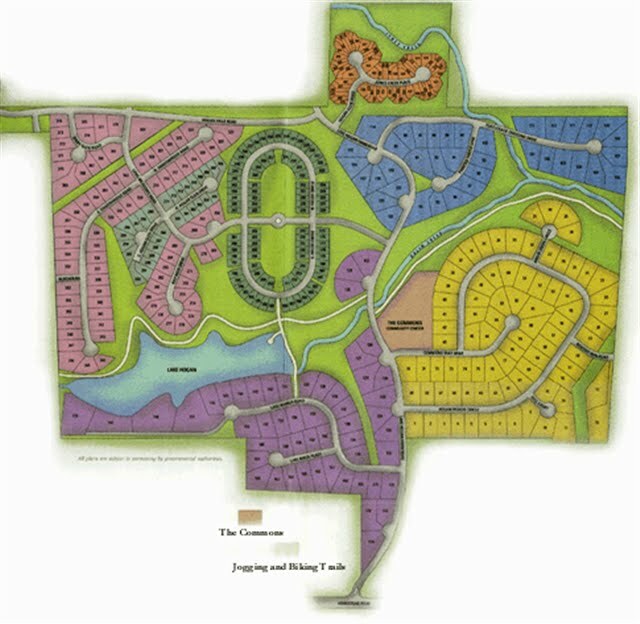 There are many new home neighborhoods to consider for your new home. Buyer gets keys when deed is recorded. Usually several hours after closing. Building a home is a process that usually takes 5-7 months. The on site agent represents the builder and must work in the builder’s best interests. Often there are questions that come up and sometimes disagreements during the building process. Having an experienced agent as a go between is a big help. A good buyers agent will be with you from the first steps of pre approval and homesite selection through closing. The builder pays the buyer’s agent fee if you bring your agent on your first visit and sometimes before contract. It won’t cost you more to have a buyers agent. Read my post about why you need a buyers agent with new construction. It’s always a good step to have a loan pre approval with a local lender before you start looking for a neighborhood and builder. The market is competitive and if you are prequalified the builders agent is more likely to work with you. Most builders offer to pay $2000 to $3000 in closing costs if you use their preferred lender and attorney. Sometimes this is a good deal but not always. Some builders own the mortgage company. When the builder has outside preferred lenders the builder doesn’t actually pay closing costs. The contribution comes from the rate and fees. It’s always good to shop around. Sometimes we can get the closing costs paid even with your lender if they are local and have a good reputation. In this case, think of the closing costs as part of the negotiations. You may get closing costs instead of another incentive. Most builders follow a similar process when a home is sold before construction has started . Often called a pre-sale, this is a way for you to get the home you want on the home site of your choice. The building company determines how much customizing allowed. Most custom and semi custom builders start with an existing plan they have built before and work with you to tweak it to fit your desires. You should let the site agent you are shopping around and don’t act too in love with anything to help out later with negotiations. In the Triangle it usually takes around 5 or 6 months from permit to build for a production builder home. The building time can vary depending on how many homes are ahead of yours on the builder’s production schedule. Large national or regional builders are often called production or tract builders. There are some very good production builders. Examples of production builders in the Triangle are Cal Atlantic, Pulte, M/I Homes, Lennar, DR Horton, Beazer, Toll Brothers, NV Homes and Drees. These big builders have priced many structural options (changes to the plan that are necessary for the building permit). These are usually the only structural changes allowed. Custom and semi custom new construction builders have many options, Sometimes the builders architect will design the plan exactly as you want it. 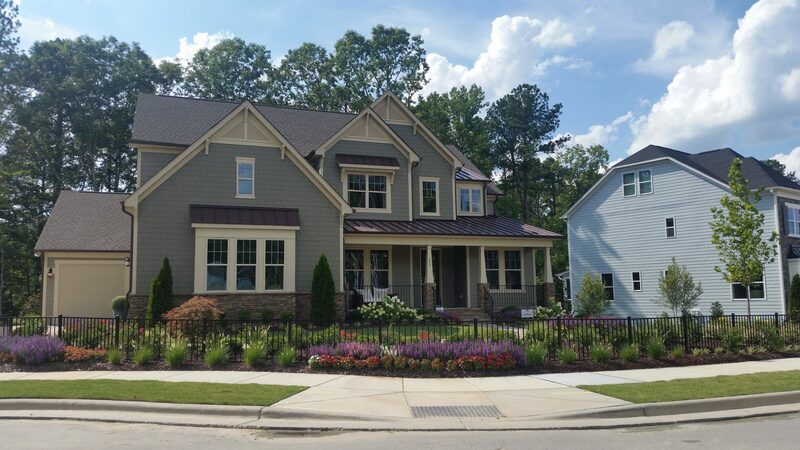 In the Triangle a couple of my favorite custom builders are Wardson Construction and Homes by Dickerson . There are many questions to ask the builders representative if you have narrowed down your neighborhood choices. What are the included features in the base price of the homes? How much does the typical buyer spend on design center options? What is the estimated build time after contract? Are the lots developed yet? If not what stage is the development in? What lots are available and what are the lot premiums? What incentives does the builder offer? Has the agent heard these are going to change? How does the builder usually structure price increases? I always ask to see the recorded plat, the pretty colored site plan map doesn’t have real information that you need when choosing a lot. How much are the deposits and how do the builders structure them? First get the recorded plat. I usually ask the builder’s rep what lot they think is the best. They are on site everyday and have walked them all. This is helpful and a starting point. You can get good info from that question especially if the site is under construction. Some lot premiums are worth it and some not, it’s humans grading the lots so a good lot may have been overlooked. We’ll look at a lot of factors like the slope, drainage, easements, position, yard, trees and resale. After you have decided on a lot it’s time to do a lot hold. Most builders will do a lot hold while you work on the plan. You should be serious about building with that builder and on that lot. A lot hold is usually for a few days to 2 weeks, $1000-$5000 and is refundable. It makes sense to pick the lot first because you will be spending time and energy working on the plan. We need to make sure the house will fit on the lot. This is hard! Trying to figure out the price before you have customized the plan is necessary so you can keep on budget when making changes. I usually ask to see a list of priced specs for a similar plan that we have seen. Every builder is different with the pricing structure. You can’t assume by looking at the standard feature sheet you won’t add $$$$ at the design center. I go through the spec sheet and see how it compared with what the buyer wants. It’s usually surprising how much extra you can spend, even when everything is included. I have never had a client spend nothing at the design center. Structural options are options that you choose at time of contract with the cost added to the builder’s base price for a contract price. Structural options affect the building permit. 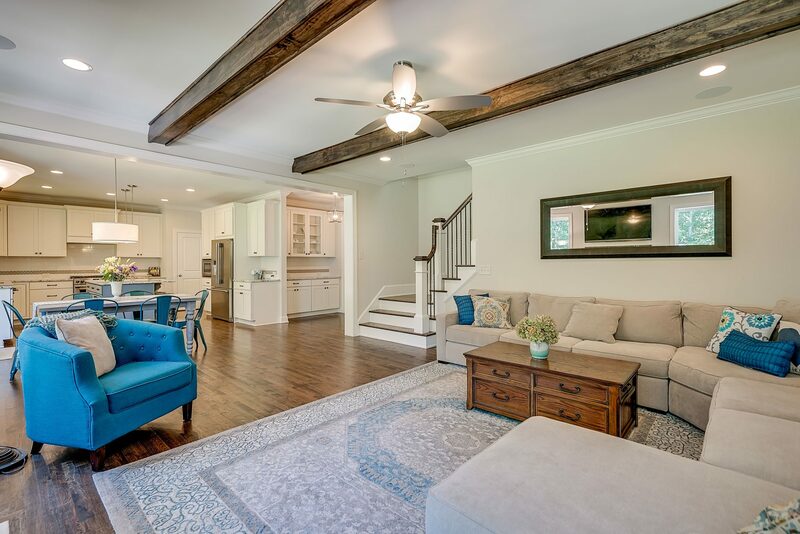 Some examples of structural options would be room bump outs, coffered and trey ceilings, screened porches, door and window changes, fireplaces, gourmet kitchen upgrades, extra baths, and plumbing extras. These can add up to tens of thousands of dollars. Production builders have structural option choices that are usually set in stone. They won’t change anything that isn’t on their option list. Some builders will do a special request for plan options and pricing but don’t expect this to be common or quick. Custom and semi custom builders have a lot more flexibility to make the plan your own. The process is lots of pricing and back and forth tweaking the plan. The process can be quick for minimal changes or take a long time if you are doing a custom plan. The goal is to get it right but as quickly as possible. Builders tend to raise prices as homes sell and it’s good to get under contract and have the price locked in. It’s not common to get a deal with a pre-sale. Some builders won’t negotiate. Builders usually offer incentives and sometimes if a home is started or sitting finished we can get a better price or free options. Knowing what the “get “possibilities are depend on experience with the builder, supply and demand, time of year etc. Don’t expect huge discounts but we can usually get something in extras or a bit off the price. It’s time for the contract. The contract price will be the base price plus the lot premium and structural options. Design center options will come later. Builders contracts are totally biased toward the builder and they won’t change the contract. This is where there is risk and you have to trust the builder’s reputation. Deposits vary. Here is a link to a post I wrote about new construction deposits. In most cases the deposit (varies between $5000 and 10%) is all you pay until closing when the deposit is applied to your down payment. You should have been pre-approved before looking at homes. The contract will require you to apply for a loan by a stated date. Most builders have a preferred lender or several to choose from and will pay $2000 or $3000 toward closing costs. I would compare rates and fees with the lender who pre-approved you. Sometimes the builder doesn’t actually pay closing costs, the lender makes the money up from the rate. Most big builders have a design center with a designer to help you with selections by appointment only. Sometimes you have one appointment and with other builders you may have 2 or 3 appointments. Be prepared by having a list of the features you may want to upgrade based on the inventory spec sheet we got before contract. Have exterior photos of the colors of homes you like. Have a couple of choices because there are usually restrictions about colors being close together on the street. You may not get your first choice. Occasionally, my clients won’t be able to come back for appointments. If that is the case, we need to do as much as we can with the on site agent before you leave town. I like builders who have selections in the model home. There aren’t as many choices but it’s convenient. Sometimes you can go to vendors in your area to see the selections. It depends on the builder and level of customization. Know your budget and be ready to stick to it. It’s so tempting to upgrade especially when an item doesn’t seem very expensive. It all adds up. I can help with what is best for resale or suggesting what will give a similar look without upgrading. A good place to spend your money is hardwood floors and stairs. That makes a difference with resale. This is where you meet your builder or project manager, go over the plans and specifications including design center options, in detail, and discuss any special concerns. The pre-construction builder meeting takes around 2+ hours and is important because you are building a relationship with your builder while making sure you are on the same page. The pre drywall (sheetrock) meeting is a walk through with the builder after framing, electrical, plumbing and heating and air rough-ins. This is to make sure light fixtures, cable and phone outlets are in the right place and you are good with placement before sheetrock covers the walls. Walk through for new construction blue tape. 7-10 days before closing you will do a walk through with the builder. This is a new home orientation as well as a time for you to point out cosmetic items that you want repaired. This list is called a punch list. Some builders do a great job getting the house ready for the walk through. I don’t feel like it’s the buyer’s job to do a builders punch list for them so I expect the house to be ready. 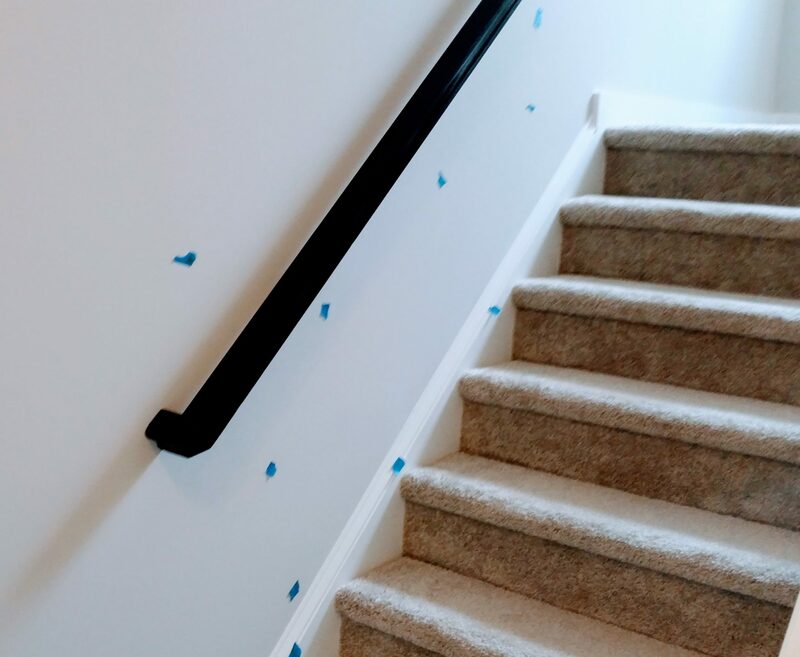 No house is perfect though and you may use a lot of blue tape. A home inspection is a good idea even for a new home. In NC builders warranty is one year. The builder comes back before the end of the year to do a last repair list. Sometimes my clients don’t have the inspection before closing but wait until right before the end of the year to have the inspection. This gives the home time to settle and for drainage issues under the house to show up. The downside of this is the builder could go out of business or just not come back. Builders usually want the home inspection done around the same time as the walk through, 7-10 days before closing so the contractors can take care of issues on the same visit. Right before closing we have a final walk through to make sure the punch list and inspection items are done. It doesn’t take long. We usually go straight to closing at the attorney’s office from the final walk through. The builders usually pay the attorney fee if you use their attorney. It’s just easier for them to close everything from one office. The closing is where you sign the loan documents. When the deed is recorded in the court house the house is yours and you get the keys. I think it’s fine to use the builders attorney for closing. Most people wire their down payment funds or bring a certified check.. Here is a link to more detailed information about closing. New homes have warranties. Builders typically come back and do warranty work (defects on workmanship and materials) within the first couple of months and additionally at the end of the year. This is a builder backed warranty. Your systems and appliances have their own warranty. The builder contract usually addresses warranty. Some builders buy a warranty for an extended period of 10 years. The structural warranties have defined limits which is good for builders. It’s a protection for them as well as the buyer.